Back in the day I worked in an Architectural Visualisation Studio that used Electric Image (EAIS) and that had truly poor support for GI so all lighting was done with hundreds of soft spots and it was the biggest pain and slowest way of working I have ever encountered. Setting up a scene for render is enough work never mind doing a thousand tests to check that you lights are all blending, no thanks I'd rather use GI. I entirely use GI in Carrara and have done since version 5. A typical interior daytime scene will have a distant light shooting in through the window with Indirect Illumination set at 100% (check the manual as to why) and maybe one or two soft box anything glows lights to help out with dark corners and to highlight stuff, set up like a photographer would to shoot an interior. 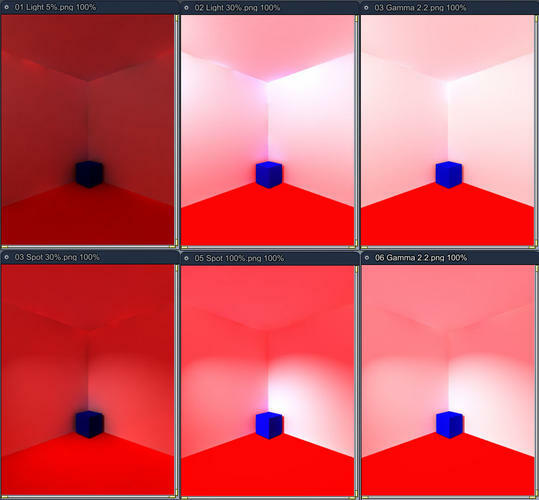 So I set up a 6 meter box with white walls and a red floor and placed a blue cube in it for interest. I then did some tests with a bulb light and then with a spot light for comparison. great images :) I specially like the first one, it has a nice realism feel to it. When I first started out (almost 3 whole years ago :D) I tried recreating pictures, but soon got lost caus i had no idea what i was doing... or what the buttons were doing. I'm starting to get a better idea of how things work now, and noticing things in the real world or movies and thinking "hey, i could recreate that" :D... but i haven't gotten around to again. It is still on the list though. I want to learn making realistic renders first, mostly caus i don't have any artistic talent but also caus i think it is the fastest way to learn. And that's fine. Just keep in mind that nobody here in their right mind would have any reason to go to the extent of placing hundreds of soft spots and do thousands of tests. That is an extremely specialized requirement, not representative of the majority, or anything near it. I generally simulate GI using less than 10 lights, which includes the primary light sources (lamps, sun, etc.). Usually more like 5 lights total. And that's because usually only primary source and first bounce are needed to give an 80% result. And what I am advocating is not whether you use GI or not, it is to get people to LEARN, and then decide. Not just go for the easy solution, while having no clue what you're doing. I don't understand why anyone feels the need to simulate GI as it never looks right, it never has and it never will that's why all the major renderers have built in GI as the main tool these days. Faked GI usually has that smooth black gradient creeping into corners that instantly shows it up. If your trying to recreate what a real light would do then you definitely need a GI solution as real lights bounce! The skill is in thinking how a photographer would approach the scene and translating that to the parameters you have for your given light sources. There is plenty of creative control, even more so I believe as you don't have to guess what the effect would be and can concentrate on the intensity, colour and placement of your light source to build the mood in a more realistic outcome. By the way when the studio I worked in switched to Studio Max and Vray I got rid of the vast arrays of soft lights (to get close to properly faking reality you really do need a lot of low intensity lights to lighten the shadows, believe me I've done it) and replaced them with one light for exteriors, the sun. Check out Blender's Cycles render engine, it doesn't even use lights, just geometry emitters which is actually closer to how real lights are. As artists we should use the best tools available to get the results we want without having to jump through hoops. That's what I love about the Carrara forum. We'll get a bunch of people actually arguing AGAINST learning what you're doing. It's just mind boggling. There are many reasons why you would choose not to use GI for your renders. And I could list them. But knowing this forum I'll only get arguments in return, because nobody really cares. Woodscreation, you have a special result in mind. But apparently you can't comprehend that not everybody is looking for that same result. Archviz is different from what most people need. Not everyone needs the 100% solution. Not everyone has time for 1 hour or 5 hour or 10 hour renders because they're doing animation or they have other reasons. Like what I said that you seem to disregard: GI gives only realism, and limits artistic license. And for that, most people are real happy with something that looks 95% accurate. Anyway, I'll say what everyone here really wants to hear: You're right, I'm wrong. Woodscreation, you have a special result in mind. But apparently you can't comprehend that not everybody is looking for that same result. Archviz is different from what most people need. Not everyone needs the 100% solution. Not everyone has time for 10 minute or 1 hour or 5 hour renders because they're doing animation or they have other reasons. Like what I said that you seem to disregard: GI gives only realism, and limits artistic license. And for that, most people are real happy with something that looks 95% accurate. Joe it's a discussion. He has his opinion based on his own experiences and needs and you have yours. You're both right. For what it's worth, I agree with you that learning to simulate GI is a good thing. Especially if the goal is animation. However, GI is also an artistic tool included with Carrara, and has it's own value. As has been made very clear in this thread, there is also a learning curve to get the desired results from GI. It's not a Make Art button after all. Why not learn both? That's my point. Why not learn both? But every single time I suggest in any thread that people learn the "other way", the non-automatic, non-software approach, which requires some actual learning and maybe having to delve into some science, all I get in return is arrogance and arguments in favor of the automatic software approach. Always. Nobody is interested in learning both, they only want the easy way out. Always. You know that, I know that. Which is evident by you addressing this post to me, not the other guy. He gets defensive about his position, but you think I'm the one that needs to behave. You guys are so insanely biased against anything I say that you automatically support the other guy. And in the process people who really want to learn stuff get the idea that learning this stuff is for dorks and poindexters, and the really cool people use the cool software approach. Yes, learn both. Exactly. But to do that you have to ACTUALLY LEARN BOTH, and support each other in learning both. Get it? Which means you have to actually discuss and investigate both approaches, instead of automatically shutting down those you don't like. Dude, you're a master at this stuff, right? Why don't you post some tutorials showing how to get some great results using simulated GI? That would be a lot more helpful than telling me to behave. Fist off, I never said I was a master. I said I try to simulate GI, and sometimes I get good results. I'm getting more consistent and each time it takes less time. I have posted many suggestions regarding GI in this thread alone and have received plenty of rebuffs from you claiming my suggestions aren't relevant or were obvious. Maybe I should go into a rant like you would, and lament the fact that the world is too stupid to understand my obvious and exclusive genius? Secondly, he's explaining his viewpoint as to why he doesn't understand why people fake it. Nowhere did I read that you shouldn't learn it. Obviously he has a different experience and opinion. I didn't read it as defensive. But then again, there was another post I read that was definitely defensive. (see below). That’s what I love about the Carrara forum. We’ll get a bunch of people actually arguing AGAINST learning what you’re doing. It’s just mind boggling. For decades, film production studios have used the quickest means they can to produce the quality they can live with. And for decades, that has meant finding the fastest way to simulate real world lighting (and other things). And for decades that has meant doing what many here would call "cheats" and "faking" GI. And I can pretty much guarantee that just about everyone here has paid money to watch a film that includes non-GI rendering. And I can also pretty much guarantee that you were amazed by it. That's why anyone feels the need to simulate GI. It works, and it's faster, and it gives usable results. That's what many commercial producers need, not a completely 100% hyper accurate image that looks like a photograph. Sorry, but that's factually incorrect. Yes, real lights bounce. And you can simulate that, as you well know. There is plenty of creative control, even more so I believe as you don't have to guess what the effect would be and can concentrate on the intensity, colour and placement of your light source to build the mood in a more realistic outcome..
Maybe for you personally there is "plenty of creative control" but I can assure you that for many professionals and non-professionals, including many who are producing feature films, that's certainly not the case. Not even close.